The duo that makes up Magnets & Ghosts returns with a six-and-a-half track mix that pushes aside some of the pop friendliness of their debut Mass, and allows more rawness into their sound. Some might even consider Be Born a rollback, adding more of Dean Roland's affinity for raw rock. Partnering with Ryan Potesta for the second time in three years, Be Born finds the band splitting the EP between atmospheric ballads and alternative rock bruisers. The band is promoting the EP with an exclusive stream of the single Drug Money via Diffuser. The tone of it tells some of the story. "The song was inspired from playing live shows," Roland tells Diffuser. "We wanted to explore a more raw 'in your face’ side of our musical selves." The move is on target, given that the introspective moodiness of Mass was sharp, but clearly lacking in energizing live shows. In terms of rockers, the duo had largely leaned on Light My Flame as the cornerstone of their edge creds. It was just enough to let fans direct them toward a harder sound. Of course, that is not to say they have given up on sonic prowess. After an interesting instrumental open that soars with a touch of orchestra-infused rock, Off My Mind delivers the smoothness that critics appreciated off Mass tracks like Hold On and Like A Sunday. But even with the riveting silkiness of Roland's softer side, the band brings a sharper guitar and percussive bounce to it. Be Born splits between the difference between soar and blister. Drug Money is strategically dropped between the mellower fare of Off My Mind and Here To Save Me, which carries that dreamy rock quality that Roland has always favored. The song itself was written by Potesta in his car while searching to find some meaning in his current situation. He needed to be rescued. This EP might do that. Magnets & Ghosts immediately follows the track up with I'm Not The Devil. The seed of it came from Potesta, with Roland encouraging him to finish it. The track itself is short on meaning but big on aggression — an exercise easily described as capturing how it feels to be pissed off. The band closes with a grunge rocker that Roland had been holding on to for some time, Be Born. The title track came together with a promise to create a bigger vibe for the band. It works, giving fans every indication that the duo is ready to let go of the past and bring about something better. The result is a poignant EP that adds in some much needed rawness. 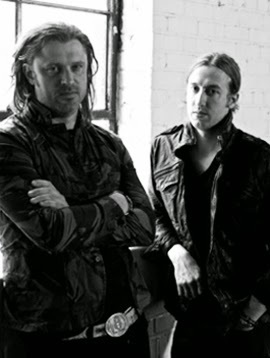 Roland and Potesta originally met in 2007, but it wasn't until Collective Soul was on hiatus in 2010 that the duo began talking about the possibility of a new project. The first night they started writing songs, they came up with three concepts that made Magnets & Ghosts a cohesive duo. Be Born By Magnets & Ghosts Hits 6.8 On The Liqui Hip Richter Scale. Magnets & Ghosts is a unique project in that Roland and Potesta perform, produce, and mix most of the songs By writing and producing together, the artists feel free to take more chances until it becomes what both of them realize as their vision. And with the added ability to write some songs on the road, Be Born has become a deinfing moment for the duo. Expect more from them. You can find Be Born [Explicit] by Magnets & Ghosts on Amazon. You can also download the Be Born EP from iTunes. For more information and upcoming tour information, visit Magnets & Ghosts on Facebook. They are currenly playing independent shows, with most of them booked in California.